Robert Crais is the popular author of the Elvis Cole and Joe Pike novels. Reading the Robert Crais books in order takes us to the wonderful world of Elvis Cole, Joe Pike, as well as the new Scott James & Maggie, three interconnected crime mystery series featuring two private eyes and a police officer (and his dog Maggie) working in Los Angeles, California. Here are all the Robert Crais books in order for his series as well as his standalone novels. The books are listed in chronological order with the book reading order in brackets, and year of publication added at the end. The author Robert Crais was born in 1953 in Independence, Louisiana. He is an adopted child who grew up in Baton Rouge. He wanted to write stories from a very young age. Short stories, novels, comic books, TV and movie scripts, he wanted to write them. 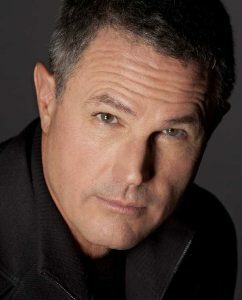 The next year, in 1976, Robert Crais moved to Hollywood and began a career as a scriptwriter for series such as Cagney and Lacey, Miami Vice, Hill Street Blues, and LA Law. He is currently living with his wife in California. The first series he worked as a scriptwriter on were Hill Street Blues, Cagney & Lacey and Miami Vice. Robert Crais’s debut novel is The Monkey’s Raincoat (published in the late 1980s), which he wrote after his father’s death. In an interview, he mentioned that he always wanted to be a writer but he never really had a story to go on with his dream. After his father died, the story suddenly was there, and some moments in the book became very personal to Crais. The book is still one of my favorite novels. I did pick it up several years after its publication and I had no idea at the time that it was also the first book in an already established series. I soon tracked down the rest of the books published so far, and have been buying the next and the next book ever since. Some of the books in the Elvis Cole and Joe Pike series intersect, while others are clearly separate from each other. While the two main characters feature in all books, there are novels where Joe Pike takes a front seat in solving the cases presented to them. And then we have Scott James and his dog, Maggie, featuring in yet a new series, again where so far at least one book is also part of the author’s two other series. The latest Elvis Cole & Joe Pike book (focusing more on Joe Pike) is released in 2017 under the name The Wanted. In addition to the two series, Robert Crais has also written so far 4 standalone novels (of which I have read the latest, The Two Minute Rule, which I still have at home in a hardback cover. It’s a great book, but if I had to choose, Elvis Cole is still my favorite). Over the years, the author has received several awards for his writing, including the Anthony Award for Best First Novel, the Mystery Readers International Macavity Award for “Best Paperback Original”, the Ross Macdonald Literary Award, and the (PWA) Lifetime Achievement Award The Eye, along with Mystery Writers of America’s (MWA) Grand Master Award. Several of the Robert Crais books ended on the bestseller lists of both the New York Times and the Los Angeles Times. The author has received so far several inquiries and offers for turning his favorite character, Elvis Cole, into movies, however, he turned all offers down. He prefers to keep the readers’ minds engaged in imagining how Elvis Cole looks like and acts rather than spoonfeeding them with an image created by Hollywood. The latest Robert Crais series is Scott James & Maggie series, featuring an LAPD police officer and his working dog, the military-trained German shepherd Maggie. The Robert Crais new book in this series, The Wanted, is also part of the author’s popular two series, Elvis Cole and Joe Pike, as he brings the two PIs into this new plot as well. In The Promise, the Elvis Cole and Joe Pike team joined forces with Scott James and his faithful dog to unravel a dark conspiracy involving a convicted fugitive, murder and a missing woman. These are the ingredients of an action-packed story, which Robert Crais is well-known for. When Elvis Cole becomes a suspect in the current case he is involved in, it takes Joe Pike and Scott James all their efforts and talents to learn Elvis’s name and move the case forward. I loved Maggie, she had her own chapters in the book. I think she really stole the show here. I hope there will be more books with Maggie and the series continues soon with new stories. In The Wanted, a single mother comes to Elvis Cole disturbed by what she found in her son’s room: lots of cash, an expensive Rolex, and some valuable clothes. She wants to hire Elvis to find out what is going on with her high-school child. What he finds, of course, is not what the mother suspects (being involved in drug business), but something equally disturbing. For the Elvis Cole / Joe Pike series, reading the Robert Crais books in order should be recommended. I definitely gained a lot by not reading them out of order. /Actually, The Promise really does follow Suspect. Maggie is a winner. You are absolutely right there. I am actually reading now The Promise while waiting for The Wanted (the latest Robert Crais book) and it’s true The Promise is the second book in the author’s new series. I have updated the page with the correct entries. Addicted to the books!! I have finished 9 books and will find the rest. Elvis and Joe are very good partners, perfect. They complement each others characteristics/ personality. I wish Joe Pike got more books and bigger rule. Robert Crais is a bestselling author, with great humor! !